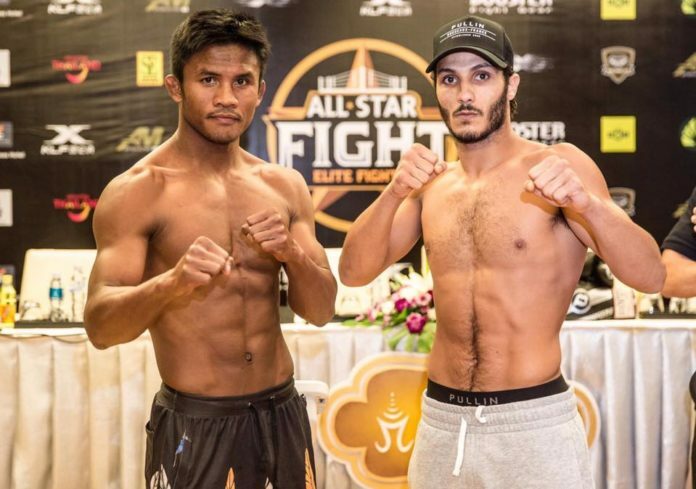 Famed Muay Thai fighter Buakaw Banchamek faces French Azize Hlali tonight in Bangkok. The pair headlines the “All Star Fight” promotion held at Workpoint Entertainment Studio. The two-hour event starts at 9 pm (local time) live on TV. Since October 2015 Buakaw (229-23-12, 68 KO) is riding a nine-fight winning streak, featuring the victories against Andrei Kulebin and Dylan Salvador, among others. Hlali (91-12-1) won two of his most recent bouts against Morgan Adar and Noppakit. The “All Star Fight” program comprises nine match ups featuring Thai fighters up against international competitors. The roster features the representatives of the well-know Muay Thai camps such as Banchamek Gym, Fairtex, PK Saenchai and Yokkao. The list of farangs [foreigners] includes the athletes out of France, Iran, Laos, Italy, Brazil and the US. The official weigh-in ceremony was conducted on Saturday at Pathumwan Princess Hotel. The happening was streamed live on Facebook. Buakaw stepped on the scales at 70 kg. His opponent showed the same. The fight card also includes a battle between the representative of the country-host Pakorn Sakyothin and Brazilian Julio Lobo. As well, Phanrit Banchamek takes on American Asa Ten Pow, and Keawta Banchamek is up against his Thai-fellow Krobsud Fairtex. A complete fight card can be found below.